Atari, Inc.: Business is Fun, written by Marty Goldberg and Curt Vendel, was published in 2012. I purchased an autographed copy at Midwest Gaming Classic years ago. At 796 pages, it was a bit intimidating to start, so it sat on my shelf until I recently got the bug to tackle it. I’m glad I finally did! Business is Fun dives deep into the history of Atari, but from more of a business perspective (natch). We’ve heard the story plenty of times before — the one about guys like Nolan Bushnell, Ted Dabney, Al Alcorn, and their journeys through Ampex, Nutting, Syzygy, and Atari, the creation of Computer Space and Pong, Andy Capp’s Tavern, the creation of Kee Games, etc. etc. etc. But rather than another rehash of history, BIF gives us much more insight into the inner machinations of Atari by talking about the business dealings and legal ramifications of the revolutionary new entertainment Atari was inventing. Far from being a stuffy business or financial report, however, BIF is written in an informal and accessible manner which makes for a compelling story about the struggles that the real people behind Atari dealt with to make video game history. There’s less detailed discussion about the games themselves here, and more focus on the way the company was run, the interactions among owners and management and employees, and the triumphs and crises Atari dealt with throughout this formative period. There are also plenty of pictures. Seriously though, the incredible photo sections at the end of each chapter are packed with mega-rare shots of people, plans, prototypes, internal memos, and behind-the-scenes peeks that could only have come from the people who were there. Nerds like me who love seeing the minutiae of the inner workings of a legendary entity like Atari really hit the jackpot here. The book covers everything from the start of Syzygy/Atari through its sale to Warner, the introduction of the VCS/2600 and the Atari 400 and 800 home computers, the 5200 and 7800, the management shake-ups in the mid-80s, and ends with Jack Tramiel taking the reins and Atari splitting into two companies, Atari Corporation for consumer products and Atari Games for arcades. Many fans know where things went from there (especially with the 7800), but the book ends by saying “to be continued” in two follow-up volumes, Atari Corp: Business is War and Atari Games: Last in Fun. As of this post, Business is War is currently still being worked on, with no word yet on the Atari Games title. Though the cover art for BIW was revealed three years ago already, I patiently look forward to both books being released eventually, realizing what a Herculean effort a project like this must be. Overall, I found Business is Fun very rewarding to read, learning so much more about Atari than I had already known. The writing may seem a bit too conversational to some, but I think that style made this 800-page behemoth much breezier to conquer than I expected. 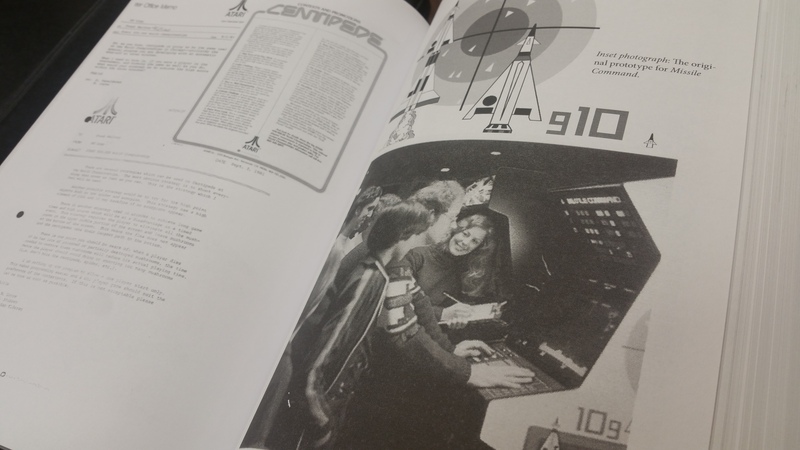 The book does have quite a few typographical/spelling/syntax errors, but co-author Vendel did mention in an AtariAge forum post a few years back that they were planning a redesigned and re-edited edition. Honestly, the errors didn’t bother me that much, as again, the book is massive and I can forgive some editing oversights. Co-author Marty Goldberg and I have sort of “virtually” crossed paths in the past, although we’ve never actually met. Both of us are Wisconsin natives. I believe we were both part of the #rgvc IRC and Usenet community back in the mid-1990s. When I ran the Metroid Database, Marty was the site director at Classicgaming.com, where the MDb was hosted for many years. Marty also co-created the Midwest Gaming Classic, which I have attended for the past 12 years running. We were even Facebook friends for a minute but I think he understandably dropped me since we didn’t have much interaction. Still, the contributions that both Marty and Curt have made to the classic gaming community over the years can’t be understated, so there should be no doubt that their book projects are worth paying attention to, so please encourage them in their work! Whether you find it on Amazon or buy it at MGC or another classic gaming event, Atari Inc.: Business is Fun is definitely a necessary addition to any videogame historian’s library, and I eagerly await its follow-ups to complete the trilogy. I’ve been meaning to read more on the history of games…may just have to pick this one up.